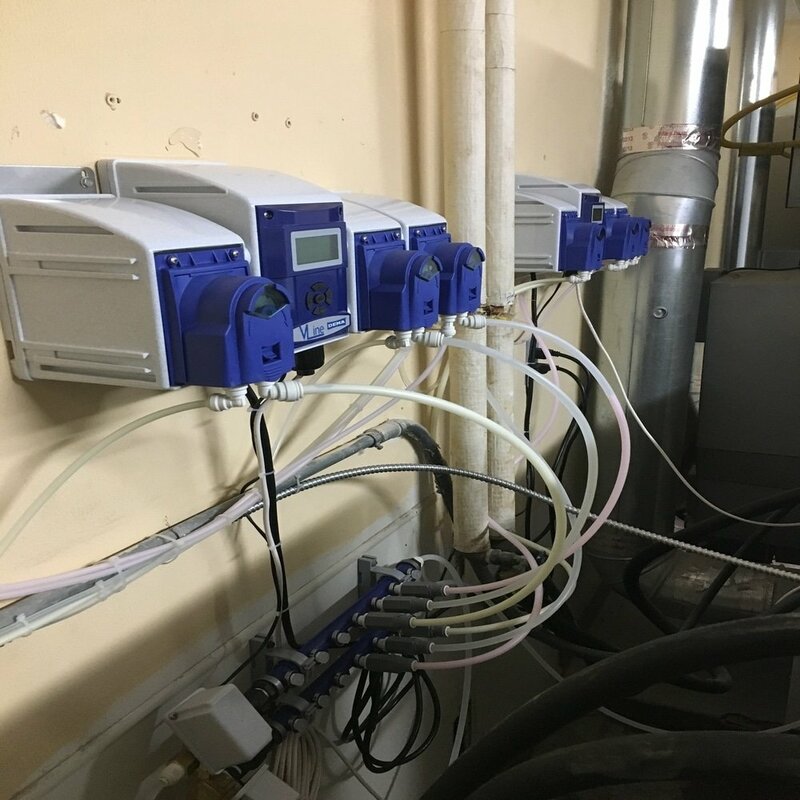 The INTEGRA SystemⓇ was developed by Anderson Chemical Company over several years and is the most innovative product delivery system on the market. 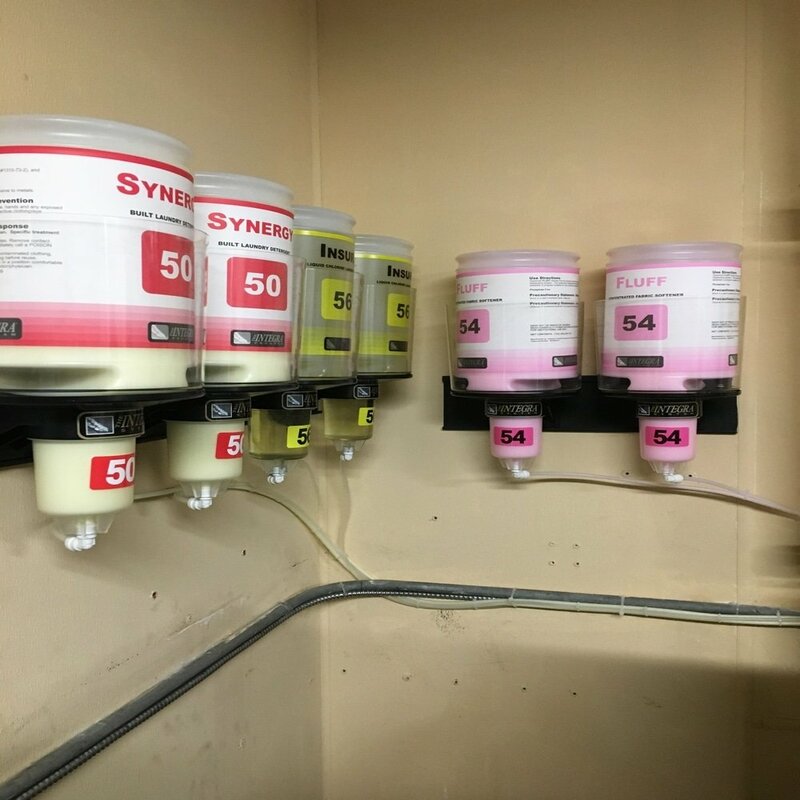 Prior to this system, laundry chemicals that were injected into washers-extractors needed to be pumped out of 5-, 10-, 15+ gallon containers placed on the floor. Not only were these containers large and heavy to move, but they also resulted in loss of product due to inefficient pumping technologies leaving wasted product at the bottom of the containers. 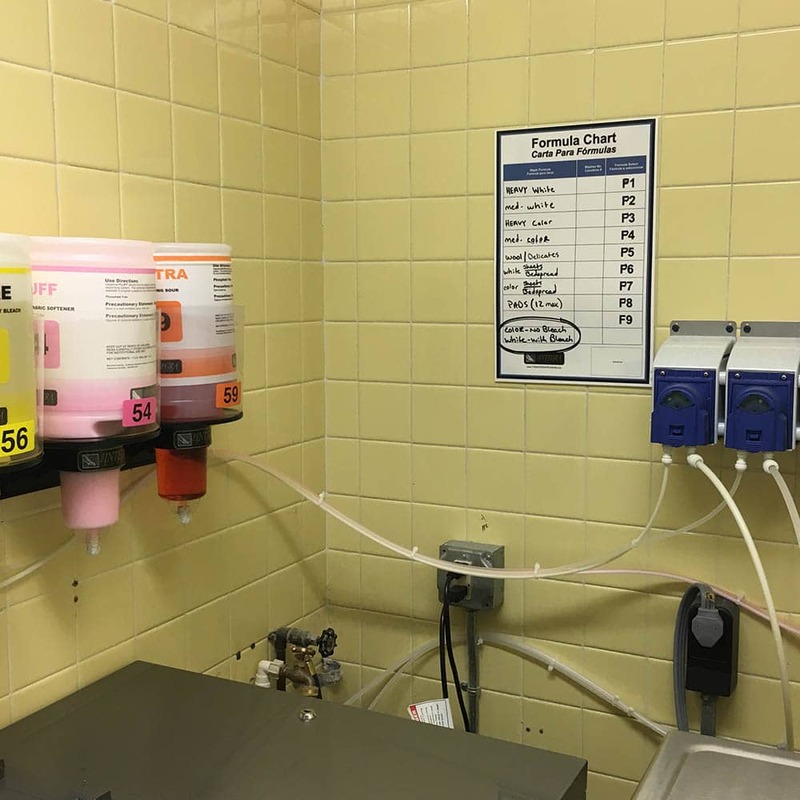 Due to the hazards left behind as the drum depleted, hazmat teams are frequently required to dispose of the remaining material which increases the overall cost of utilizing this system. Eliminates the need for strenuous lifting and hazardous waste disposal by specialized hazmat crews through their packaging and delivery integration. All INTEGRAⓇ products are packaged in one-gallon containers which saves the operator storage space and eliminates heavy lifting by employees. The easily installed INTEGRAⓇ Load N’ Lock wall bracket enables managers and owners the flexibility of placing the Capsules wherever they see fit. With the inverted capsules creating downward flow powered by manual or mechanical pumps, it ensures that all of the product is used – reducing product waste completely. After the capsule is empty, simply unscrew it and replace it a new capsule. Managing your chemical has never been easier. 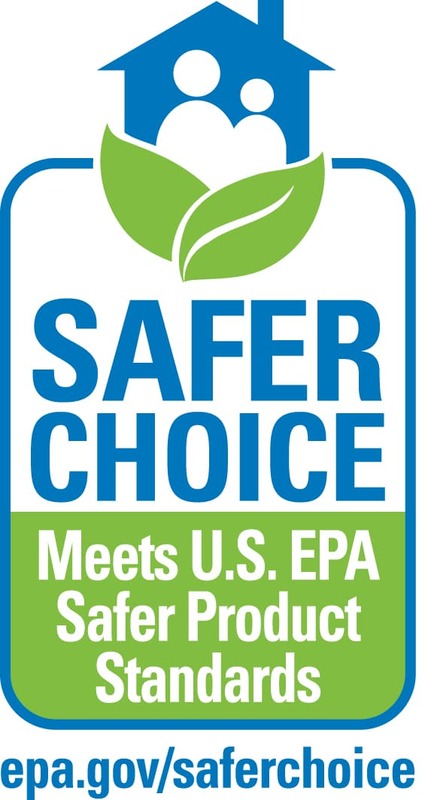 As for the disposal of the empty containers, all of the INTEGRAⓇ System products we sell are EPA approved. This means that you do not need to pay for hazardous waste teams to come dispose of your left behind product. The Capsules empty completely, and can be thrown away in trash cans, or better yet, recycled. Finale is the perfect blend of fabric softener agents and laundry sour agents. This controls pH levels, eliminates static, softens linens, and reduces wrinkles. The neutralizing agents neutralize alkaline detergent residues and water hardness minerals that normally cause iron staining and graying of fabric. Neutra – Iron Removing Sour. Liquid laundry sour developed specifically for iron stain removal. It is a pH neutralizer that is based on a powerful iron stain dissolving compound. Perfect for industrial laundries. Synergy – Built Laundry Detergent. A high alkaline laundry detergent that contain surfactants and anti-redeposition agents ensuring that as soils are removed, they are not absored into the fabric again. This produces whiter whites, and is highly effective in both hard and soft water conditions. Highly effective at removing a wide range of stains including grease and food soils. The SR-2 is formulated specifically to complement the INTEGRA laundry program. This is a blend of emulsifying surfactants, solvents and alkalinity meant for industrial laundry only. Since the SR-2 removes stains and soils without harming the linen, the SR-2 Pre-Spotter is crucial for every laundry to preserve current linens and reduce linen replacement costs. Insure – Liquid Chlorine Laundry Bleach. A concentrated chlorine bleach for institutional laundries. Insure is safe and can be used on white cotton fabrics, but should not be used on wool, silk, and some synthetic fabrics. Accent – Heavy Soil Laundry Detergent*. A highly surfactant laundry detergent that safely removes greasy soils from fabrics by emulsifying soil and keeping it suspended to prevent redeposition. Accent is perfect for healthcare, hospitality, food processing, barrier fabrics, heavy soils, table linens, and uniforms. Accent is safe on all fabrics. SR-1 is highly effective for removing a wide variety of stains including greasy soils, food, and medicinal stains. A wide range of active solvents, surfactants, chelants and alkalinity. It is able to remove difficult stains without harming the overall fibers of cotton and synthetics. Since the fabric does not get harmed, this increase the lifetime use of linens, thus reducing costs associated with linen replacement. The SR-3 is formulated with a blend of protease and amylase enzymes to actively eliminate protein starches and stains which attract and hold stains in the fabric. This targets organic stains, and contains surfactants and solvents in order to aid in the stain removal. SR-3 helps reduce linen replacement costs by putting linen back in service. Turnout – Laundry Detergent for Protective Apparel. A laundry detergent designed specifically for the laundering of turnout gear. Turnout is a detergent with builders and designed for use in hard water and heavy soil conditions. Turnout has a pH of 9.5. Meets and complies with NFPA 1851 7.3.7 requirements. Laundry San – Laundry Sanitizer. Used by fire departments as a laundry sanitizer. It is automatically dispensed into the washer-extractor and effectively sanitizes protective gear. It reduces the count of bacteria by 99.9%, kills HIV-1, MRSA, and helps eliminate blood-borne pathogens. Laundry San is EPA registered. Meets and complies with NFPA 1851 7.3.7 requirements. A high alkaline laundry detergent that contain surfactants and anti-redeposition agents. These agents ensure that removed soils do not resettle on the fabrics. Because of this, soiled linens come out cleaner and sanitized. It is highly effective in both hard and soft water conditions. A highly surfactant laundry detergent that safely removes greasy soils from fabrics . It does this by emulsifying the soil and keeping it seperated from the fabric to prevent redeposition. Accent is perfect for the contaminted towels, surgery clothes, uniforms, and much more for veterinary clinics. Accent is safe on all fabrics. A concentrated chlorine bleach for institutional laundries. Insure is safe and can be used on white cotton fabrics. However, it should not be used on silk, wool, and some synthetic fabrics. 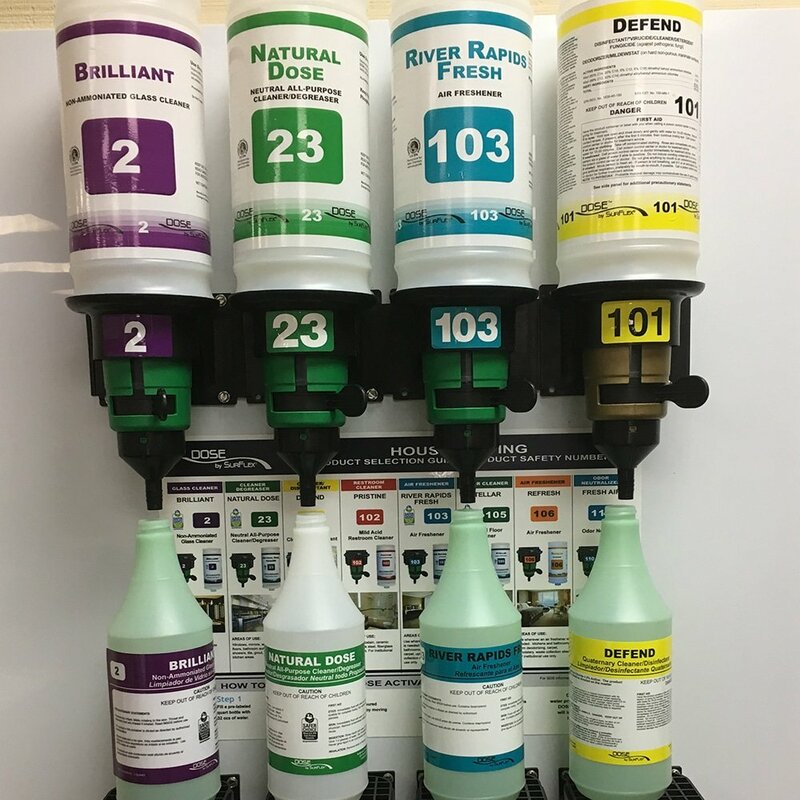 Q-Force – One Step Germicidal Disinfectant Effective For Veterinary Clinics. No-rinse, neutral pH, hospital grade disinfectant cleaner that works in one step. Q-Force is effective at killing the following: Influenza A H3N2 virus, H5N1 virus, Hepatitis B Virus, Hepatitis C Virus, and HIV-1 bloodborne pathogens. Dosing includes ½ oz. per 1 gallon of water for disinfecting. Animal Premise Virucidal Performance: effective against canine parvovirus, rabies, Pseudorabies virus, Vaccinia virus, and more. Reclaim – Powder for White Linens. A powdered laundry additive designed specifically to restore linens that have been discolored through various stains and soils. SR Reclaim leaves fabric bright and clean without damaging the linens. This reduces the amount of linens needed to be purchased. Propel – Laundry Performance Booster. A concentrated laundry additive based on hydrogen peroxide that is designed to be used during the wash cycle as a detergent additive. Propel provides excellent soil removal, and pairs well with Ozone systems. It brightens and whitens linen, eliminates stains, and is color safe. Harmony – Detergent with Oxygen Bleach*. An environmentally preferable, non-phosphate liquid detergent engineered to be used on personal linen. With the combination of oxygen bleach and detergent, Harmony brightens, whitens, and attacks tough stains. Neutra – Liquid Iron Removing Sour. Laundry sour that is developed specifically for the removal of iron stains. Neutra is a pH neutralizer that has powerful iron dissolving compounds included. It is perfect for party and linen rental operations. Incredibly effective at removing a wide range of stains including grease and food soils. SR-2 is formulated specifically to work hand-in-hand with the INTEGRA laundry system. This is a perfect blend of emulsifying surfactants, alkalinity, and solvents meant for industrial laundries only. SR-2 Pre-Spotter is critical for every laundry to preserve current linens and reduce linen replacement costs since it removes stains and soils without harming linen. Fluff – Concentrated Fabric Softener. A pleasantly scented fabric softener designed for use in all automatic washes. This concentrated formula softens fabrics enabling them to have fewer wrinkles and less ironing. Clothes stay fresh longer, more comfortable to wear, and have less static electricity. SR-1 is highly effective for removing a wide variety of stains including grease and food stains. With a wide range of active solvents, surfactants, chelants and alkalinity, SR-1 is able to remove difficult stains without harming the overall fibers of cotton and synthetics. Since the fabric does not get harmed, the lifetime use of linens increases, and reduces the overall costs associated with linen replacement. 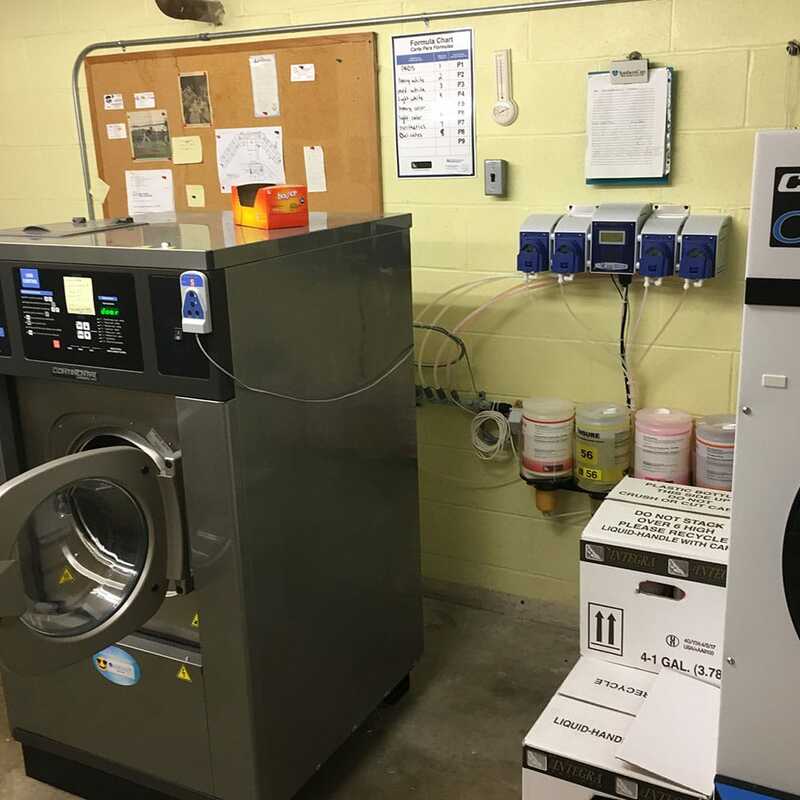 Reduced linen turnover results in a more profitable commercial rental program. The SR-3 is formulated with a blend of amylase and protease enzymes that eliminate protein stains and starches which attract and hold stains in the fabric. SR-3 targets organic stains, and contains solvents and surfactants in order to aid in the overall stain removal. Like SR-1 and SR-2, SR-3 helps reduce linen replacement costs by increasing the longevity of linen usability. Dosing by SurFlex Housekeeping . Brilliant – multi purpose glass cleaner*. Multi-purpose / glass cleaner that does not contain ammonia. This fast drying formula leaves glass sparkling and even be used on plastic and vinyl. Stellar – Neutral Floor Cleaner*. Stellar is a institutional general purpose cleaner formulated to safely clean all surfaces. It involves a unique blend of surfactants and water conditioners to make it an effective detergent. As it leaves surfaces clean and film-free with a neutral pH, it is safe to use of waxed floors. Defend is a phosphate-free institutional cleaner, disinfectant and virucide. 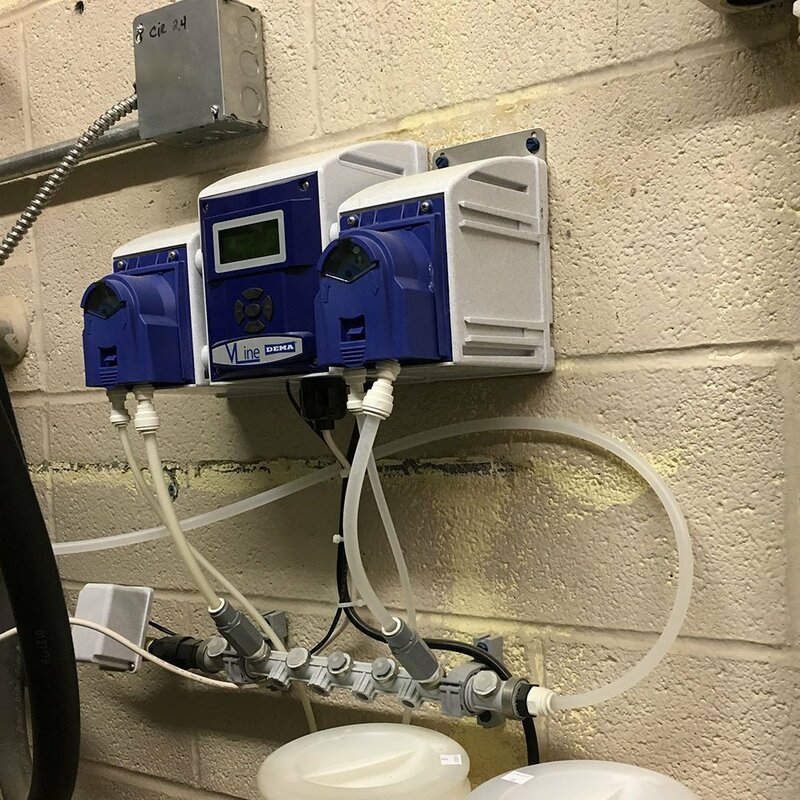 This cleaner is designed to provide effective deodorizing, cleaning, and disinfection in hospitals, nursing homes, laundromats, hotels/motels, and much more. Defend has been proven to work effectively against HIV-1, Hepatitis B Virus, Hepatitis C Virus, Herpes Simplex Type 1 when a 2 oz./gallon of water solution is applied to a previously cleaned surface and allowed a 10 minute contact time. Q-Force – One Step Bacterial Disinfectant. Q-Force is a no-rinse, neutral pH, hospital grade disinfectant cleaner. This product is effective against the following viruses: Hepatitis B, Hepatitis C, HIV-1 bloodborne pathogens, Influenze A H3N2, and H5N1. Dosing includes ½ oz. per 1 gallon of water for disinfecting. Animal Premise Virucidal Performance: effective against Vaccinia virus, rabies, canine parvovirus, Pseudorabies virus, and more. Natural Dose – Neutral All-Purpose Cleaner/Degreaser*. River Rapids Fresh – Air Freshener*. River Rapids Fresh is an air freshener that can be used wherever odors are an issue. Pristine – Mild Acid Restroom Cleaner. All purpose restroom cleaner designed to remove soil, stains, soap film, and hard water deposits. Pristine is based on organic salt that acts like an acid, so it is phosphate free, contains no volatile organic substances, and is easier to use than other acids. Safe to be used on porcelain, ceramic tile, stainless steel, fiberglass, and Formica. Pristine is not considered a corrosive material by the Department of Transportation.